HomeBusinessWill Output Return to the Pre-Crisis Level? How strong the economic recovery will be depends on whether we believe that output will quickly return back to the trend that was following before the crisis. Economists tend to think in terms of potential output as driving the trend of output and recessions as being temporary deviations from this trend. During the recession the output gap becomes negative (output is below potential) and the recovery brings output back to its trend, closing the output gap. There is, however, evidence that output does not always return to its trend after a deep crisis. The IMF World Economic Outlook has just released its two analytical chapters from the September/October issue. 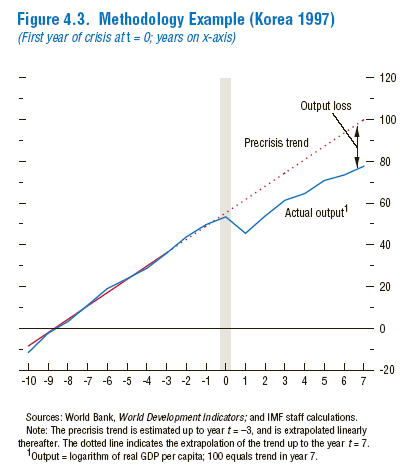 Chapter 4 (which can be found here) deals with this issue: whether output will return to trend after the crisis. Their conclusion, after looking at many different historical cases, is that banking/financial crisis tend to leave a permanent (or at least a medium-term) scar on the economy. Here is a picture from Korea after the 1997 crisis (picture borrowed from Chapter 4 of the World Economic Outlook). As we can see, 7 years after the crisis, output is still far from the pre-crisis trend. There are many other examples like this one and the evidence supports the notion that there is a mid-term costs of financial crisis so that output stays below trend for several years. having a low initial decline on output (e.g. the severity of the recession during the first quarters). having a level of investment before the crisis which is not far from historical standards (e.g. the pre-crisis boom did not drive investment rates too far from historical levels). having more policy room to maneuver (low inflation, current account balance) before the crisis. And policy makers are warned once again about the difficult balance in their exit strategies.